On a recent flight to visit my friend Sabrina of Seriously Sabrina Photography in Lexington, Kentucky, I watched the movie Moulin Rouge. I have always loved the movie. It is full of love & romance, loss, styled with a beautiful mix of boho & glamour, plus it has incredible music. There is one scene in the movie where the lead actor, Christian, is sitting in a room, frantically typing out the love story of himself and Satine. The walls of the room he sits in are covered in typewriter paper that shares their unique story. I was inspired and knew I wanted to do a couples shoot that played off of this. Upon arriving in Lexington and sharing this idea with Sabrina, the planning began. We knew we wanted to turn it into an elopement and soon after, we met Bruno & Courtney and learned of their real life love story. They were perfect. If you wish, their story was featured alongside our images by FAB YOU BLISS! So you can check that out here. This entire shoot was DIY'd with Moulin Rouge in mind. We chose to work with the colours red, green, gold & of course had to include some glitter. 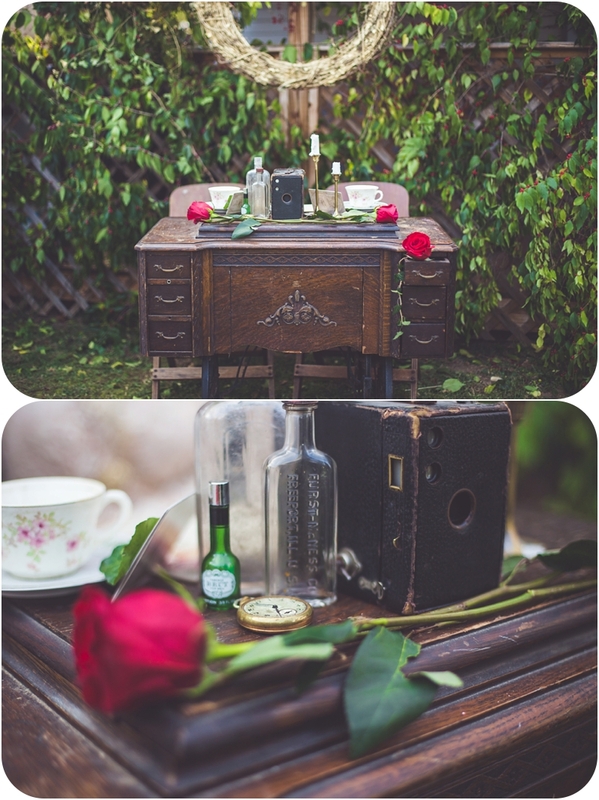 Sabrina has a love of thrifting and so we were able to explore through her collection and find perfect details such as the old sewing table perfect for holding the vintage typewriter, old bottles, music paper etc. We created the cake and decorated it with icing, vellum papers and bits of nature from the yard and then mixed flowers and greenery were purchased to create a romantic cascading bouquet for the bride. One of my favourite DIY details we included was taking old vintage books, putting vellum paper on some of the pages and placing the vows on the pages, a beautiful way to keepsake the sweet words a couple wants to share on their special day. I loved the little typewriter letters we found and created the vows with. Sabrina found the stunning vintage dress only a day earlier and also created the twig centrepiece for the couple to stand below for the elopement vows while I covered old vintage doors with tons of hand picked ivy, music sheet paper and botanical papers for a unique, one of a kind backdrop that reflected the original inspired idea and made for gorgeous couples portraits! The black rings captured in the images are the couples real engagement and weddings rings and we had to include images of them holding their own vintage cameras since photography was such a huge part of how they met and fell in love. Lastly, we wanted to include glitter since there is so much glamour and glitz inside the Moulin Rouge. This is where the nighttime shots come into play and we captured Courtney and Bruno's love amongst falling gold glitter and a night sky. It was the perfect end to an absolutely dreamy shoot. 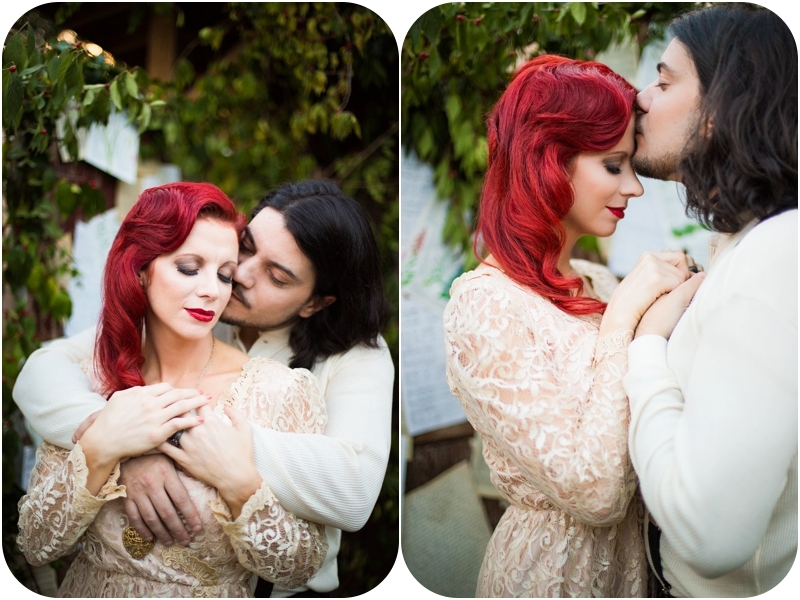 I couldn't be more thrilled with how one simple idea transformed into this gorgeous Moulin Rouge inspired elopement. 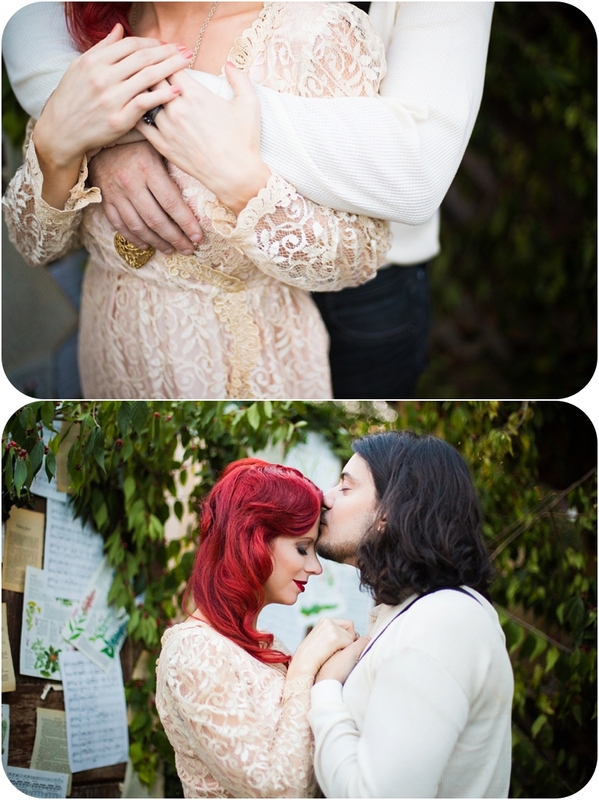 Thank you to Hair by Dominique & Makeup by Bri for their help with the styling of our couple! Getting married? Please get in touch! I'd love to chat about your upcoming special day! You can contact me HERE.